"Do not show the face of Islam to others; instead show your face as the follower of true Islam representing character, knowledge, tolerance and piety." Although he possessed a multifaceted personality, and left a significant legacy for Muslims in the colonial and post-colonial Indian periods, the perspective of Sir Sayed Ahmed Khan (1817-1898) in relation to scientific education was spelt out long ago. His projects such as the Aligarh Muslim University (AMU) and his vision have survived two centuries. This is because his thoughts carried within them a potential to foster a modern Muslim identity in India. His idea – to combine Islamic tenets with scientific and rational values and disseminate them to the younger generation – is particularly relevant today. It is a social imperative to analyze how the schools run under the AMU can serve the students with a scientific education that will determine the future of a whole generation. The educational ideals on scientific principles that are taught in these schools redeem the uncompromising outlook of Sir Sayed, enabling Muslims to overcome the social pathologies and moral corruption that have crept into Muslim societies during the course of history. Reaffirming the potential of Sir Sayed's vision and the role of AMU, Dr. Zakir Husain said many years later: "The way Aligarh works, the way Aligarh thinks, the contribution Aligarh makes to Indian life... will largely determine the place [Muslims] will occupy in the pattern of Indian life". In what follows, this essay will explore the life-long projects and visions of Sir Sayed for Muslims who want to live a life compatible with the modern scientific age. The essay would further shed light on how the future generations taught in these schools would uphold both moral values and Western-style modern education and how scientific education would determine the posterity of a country. This study would underscore the relevance of the schools run under the AMU in accordance with Sir Sayed's insight, which involves a dynamic or on-going process of reformation. Sir Sayed sought a Western-style education system to regenerate the Muslim potential in modern times. But he designed his project and worked out his educational ideas to produce a modern community that would live harmoniously with Indian diversity. This ran contrary to the colonial notion of modern education, where the main purpose for educational reforms was nurturing of colonialist interests, their ideology and the achievement of administrative needs. For his educational aspirations, he put forth an alternative modus operandi through a blend of Oriental and Occidental ideas. His method emphasized science as a field of education because of his conviction that scientific knowledge was integral to the progress of the country and the development of modern thought and culture. The scientific spirit embedded in his thought was partly formed and evolved during the time he spent in England. Initially, he founded religious schools where science was also taught. In 1863, he established a modern school in Ghazipur. His program for educational reform stressed English language-proficiency as a modern necessity for professional purposes, such as gaining a post as a munsif [judge] or as an advocate in the courts. As these bold ideas are still relevant to a great extent, so the schools supervised by AMU remain stupendously relevant. Sir Sayed understood that the decline of Islamic science among the Muslims was a result of its non-practical usage and application, as it was based on unsound principles. He addressed the need for the sciences of theology and jurisprudence [canonical law], to be, as they were supposed to be, really useful, and he argued for their inclusion in the system of education. His aim was to build a community of enlightened individuals with an elevated moral personality and qualities of truthfulness, honesty and sincerity. He believed that Quranic teachings propounded reason and natural law, while he proposed scientific inquiry as a key idea to being a good Muslim. His vision of education was also to promote the interpretation of Islamic teachings in order to reconcile the faith tradition with Western education. To make this vision real, these schools combined scientific enquiry with Quranic insight. K. A. Nizami, the famous Aligarh historian, argues that Sir Sayed had laid the foundation of a new ilmi-kalam (scholastic logic), that sought to interpret religion in terms of reason and social welfare. 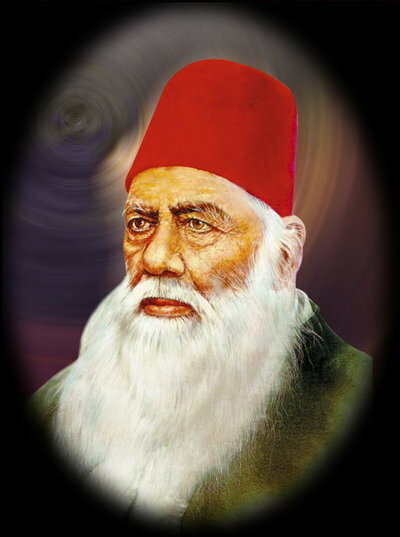 In 1884, Sir Sayed delivered a speech in Lahore in which he said, "Today we are, as before, in need of a modern ilmi-kalam by which we should either refute the doctrines of the modern sciences or undermine their foundations, or show that they are in conformity with the article of Islamic faith." This scientific temperament would axiomatically widen the horizons of the whole Indian Muslim community. Among Sir Sayed's initiatives to bring his vision to life was the modern school established in Aligarh on 24 May 1875. In the same year, he laid the foundation for the Muhammadan Anglo-Oriental College in Aligarh. He proposed to finance such educational institutions thanks to rich Muslims and British support. He was nominated to the Viceroy's Legislative Council, and Sir Sayed urged the British education commission to establish more colleges and schools across India. In 1878, he founded the Muhammadan Association to accelerate political co-operation among Indian Muslims across the country. And he became the organizer of the All India Muhammadan Education Conference in Aligarh in 1886 to promote his vision of modern scientific education. He addressed mainly his concerns for the intellectual bankruptcy of Muslims, who desperately needed an intellectual resurgence. He fought relentlessly against the impoverishment, indebtedness and backwardness of Muslims in India. And he strove for the unity and continuity in rebirth of a flourishing and vibrant Indo-Muslim civilization. These goals were integrated in his plan for his schools. Muslim India after the failed anti-British revolt, or 'mutiny', of 1857, was a landscape of poverty-stricken, down-trodden, and sullen local people. The previously-official language, Persian, was replaced by English and Muslims were struggling to adapt to the new language. Sir Sayed meditated on his own community. He found the condition of Muslims terribly deplorable. In one of his letters to Nawab Mohsinul Mulk, one of his esteemed colleagues, Sir Sayed describes how after the 'mutiny', for which Muslims were accused of treachery, he became concerned about reform of his community. Far from being a recluse, he engaged with the crisis and tried to inculcate a scientific spirit, coupled with a proficiency in English. He led powerful campaigns to fight against these drawbacks. As he recalled, "But, at that time this thought occurred to me that it would be very cowardly and unmanly to leave one's country in ruins and to enjoy a comfortable life in privacy. Now I ought to participate in that misery and it was my national duty to endeavour to relieve the miseries as much as I could and so I gave up intention to migrate and chose to work in my country". When he traced the roots of Muslim degeneration, he found ignorance as the main reason behind their backwardness. He espoused a scientific education to eradicate the two main problems the community was still facing: first, religious superstition and second, the lack of genuine sympathetic feeling between the British and the Indians. He believed that the progress of the community would depend on overcoming these evils. A proper education was the only foundation for broadening human welfare. Only this could extricate Muslims from their backward nature and set them on the path to modernity. Sir Sayed declared, "All the socio-political diseases of India may be cured by this treatment, it cures the roots and the tree will flourish." He aspired to create a system of education that would long be suitable and practicable not only for the present age but also for all the Muslims of the future. His clarity of vision can be seen in the schools running under his dream project, AMU; it proves the power of his conception, despite the obvious challenges of the time in which he lived. And it could be of real use to Muslims in the future. Sir Sayed further emphasized mass education. As he explained: "Unless the education of the masses is pushed on as it is here, it is impossible for a nation to become civilized and honored." In a greater sense, the idea of public access to education would instantly take a practical form through the schools under the AMU. This had inevitable implications for the progress of the community at the most basic levels. And it inspired other government educational projects directed to the grass roots of society. His mass education scheme of social reform was a result of his understanding that it would embrace the needs and requirements of differing classes among the people. He categorized people into distinct classes: people who aspire to a high situation in the service of the government; people who prefer to live by commerce or by some profession; people who live to improve their estates and property; people who wish to gain a perfect knowledge of the religious sciences; and people who seek knowledge of arts and science. According to Sir Sayed, the traditional system of knowledge was an obstacle in the path of human progress. He wanted an educational system free from superstitions, that would operate for the betterment of Islam. The rejuvenation of socio-cultural potential in the Muslims was used to propagate his view that Islam is not inconsistent with modernity. To that end, in 1859, he had founded a modern madrasa in Moradabad. This was one of the first religious schools to impart and promote scientific education in India. It was founded on the hope that Muslims can reach the pinnacle of progress by reforming themselves and initiating a journey toward modernity. To establish educational reform in British India he tried to harvest the fruits of British colonialism. He believed that British rule in India was ordained by God and he called for a sympathetic relation between the British and the Muslims. It was, however, a reality that contact with the British could not bring about greater benefits for Muslims. The predicaments Sir Sayed witnessed in the period following the Indian anti-British revolt of 1857 are still faced today by the post-colonial Muslims of India. J. S. Bandukwala postulates the pathetic post-colonial condition of Indian Muslims in the following words: "Centuries of insecurity drove Muslims in India away from the very forces – English, science and modernity – that would have helped them cope with the changing world. Now at last – in the aftermath of the Babri masjid demolition [in 1992] and the Gujarat killings [in 2002] – they have begun emphasizing the need for a modern education. There is much more that needs to be done – on the gender imbalance, family planning and attitudes to divorce – and Muslims have to fight their ghettoization in the cities and towns. Goodwill and understanding between members of the two main religions in India is, of course, necessary to help the Muslims in their struggle for a place of honour in the Indian sun." He advocates for an intellectual rebirth, in which new movements for change within the community would have to be formed. In his lecture delivered at the Royal Asiatic Society, London, on the occasion in 1998 of the centenary year of Sir Sayed Ahmed Khan, the famous Indian historian and former Vice Chancellor of Jamia Millia Islamiyya, Dr. Mushirul Hassan, highlighted Sir Sayed's vision as the only fruitful historical remedy for the present Muslim dilemma. He noted a striking convergence between the secular and the communal perspectives in the Indian public sphere, which produces a stereotypical view of Muslims. The AMU-run schools, which foster Sir Sayed's outlook, can address the needs of the Muslim community. Through the important values of scientific education imparted to the younger students in these schools, it is possible to produce a modern 'regenerated' community by guiding them to values of humanism and communal amity. Prior to the Hindi vs. Urdu linguistic controversy, Sir Sayed was interested in the collective education of both Muslims and Hindus. He visualized India as a "beautiful bride, whose one eye was Hindu and, the other, Muslim." Thereafter, he was regarded as a reformer and nationalist leader. Such values resonate strongly in the post-colonial context, where the Muslim society has to counter religious polarization both in the political and academic arena. Many scholars have argued that the present abysmal condition of Indian Muslims is a result of their marginalization and stereotypical representation. Thus, the propagation of Sir Sayed's vision in a larger context has become a necessity for our time. These AMU-run schools can contribute meaningfully in this regard and help overcome the grim prospects of Indian Muslims. As Sir Sayed Ahmed Khan wished to mold a modern Muslim community that can seek, understand and show a 'true Islam' through scientific education, Aligarh Muslim University and the schools under the AMU can present the true face of Islam through their educational foundation based on Sir Sayed's vision, by which students attain the true Islamic ideals of good character, knowledge, tolerance and piety. It is very important when it takes place in a global environment where Islam is viewed as a militant, belligerent and extremist ideology, although that is manifested only sporadically. The potential in Sir Sayed's vision of education to shape this modern Muslim identity is the strength that 'ensures' the strong educational foundation in the AMU-run schools. Sir Sayed's vision of a modern scientific education has the potential to trigger progress for the Indians, in general, and the Indian Muslims, in particular. His vision is all the more significant in the post-colonial context as Indian Muslims continue to languish in all social indicators of development. Education could be a major catalyst in turning around the fate of the community and Sir Sayed's vision and the schools inspired by it continue to be necessary for the progress of the Muslim community. These schools, along with the AMU, are embodiments of his philosophy of education in action. Forging this scientific education from the lower level of schooling itself would produce durable results. Bandukwala, J. S. (2006), "Indian Muslims: Past, Present and Future," Economic and Political Weekly [Mumbai], Vol. 41, No. 14 (Apr. 8-14, 2006), pp. 1341-1344. Hassan, M. (1998), "Aligarh's 'Notre Eminent Contemporain': Assessing Syed Ahmad Khan's Reformist Agenda," Economic and Political Weekly, Vol. 33, No. 19 (May 9-15, 1998), pp. 1077-1081. Hassan, M. (1995), "Muslim Intellectuals, Institutions and the Post-Colonial Predicament," India International Centre Quarterly, Vol. 22, No. 1, 100-122. Gail Minault and David Lelyveld (1974), "The Campaign for a Muslim University, 1898-1920," Modern Asian Studies, Vol. 8, No. 2, 145-189. Schimmel, A. M. (1980), Islam in the Indian Subcontinent, Brill Academic Publishers, Leiden, The Netherlands. Quoted in Mohammad Mujeeb, Dr. Zakir Husain, Delhi, reprint 1991, p. 160; see also Saiyid Hamid, Aligarh Tehrik [Aligarh Movement] in Urdu, Patna, Khuda Bakhsh Library, 1989.